Earlier this year, I compared Rovio's operating metrics with those of King's to highlight the different monetization approaches chosen by each company. In absence of updated MAU figures from Rovio, I had assumed modest growth from 263 million in 2012. 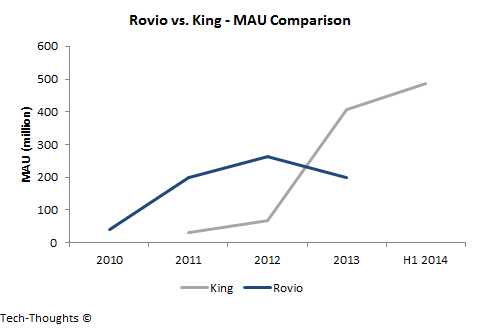 As it turns out, Rovio's MAUs actually declined by roughly 63 million in 2013. Likewise, King has faced a few challenges as well. However, both companies seem to be fighting back with very different portfolio approaches. First, let's take compare ARPU figures for both companies. With the decline in MAUs, it seems that Rovio's moves to expand in-app purchases have actually paid off, with higher ARPUs partially making up for the MAU decline. 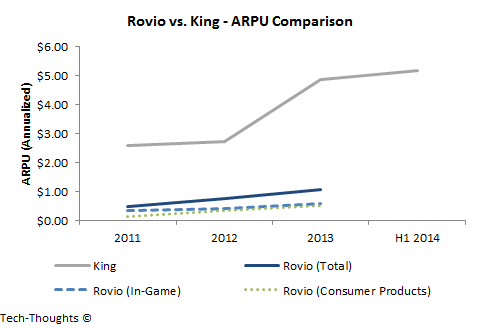 However, King remains far ahead in this battle, albeit with a slowdown in ARPU growth. While their monetization models may differ, King and Rovio have somewhat similar backgrounds. Both companies saw staggering growth on the back of a single major hit -- Angry Birds for Rovio and Candy Crush Saga for King. As engagement and revenue from their leading games began to decline, both companies have attempted to offset that with a portfolio of games. King's approach centered on multiple franchises, but game mechanics remained consistent -- Titles like Farm Heroes Saga and Bubble Witch Saga targeted an audience very similar to their first major hit. As a result, revenue and MAU declines for Candy Crush Saga were offset (at least partially) by these games. Rovio, on the other hand, focused on a single major franchise. Rovio's monetization approach focused on creating a complete entertainment franchise centered on Angry Birds (TV shows, movies, merchandise, etc.) -- some of these attempts still need to play out. Rovio also attempted a similar approach with their game portfolio. They focused on a single franchise, and diversified across genres like racing (Angry Birds Go) and role playing games (Angry Birds Epic). It must be noted that this diversification effectively began after the 2013 MAU decline. Rovio's goal seems to be to attract a wider audience to the Angry Birds franchise and monetize them across multiple channels. This strategy seems to carry a higher risk in the short term, but may have a higher upside. It should be interesting to watch the effectiveness of each approach. This contrast could serve as a terrific case study for hit game developers in the future.